Like a leisurely walk through an empty Zen garden, Duane Pitre's latest effort is an exercise in modal relaxation. 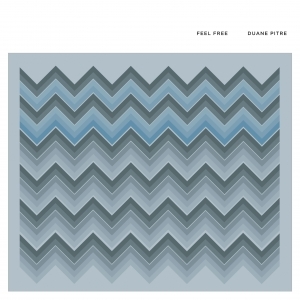 Following up his 2007 effort on Important, the majestic and transcendent drone poem "Organized Pitches Occurring in Time," "Feel Free" finds Pitre reaching for something slightly more aggressive and brittle, emerging out of the considerable din with a piece that is both lulling and thoroughly engaging. The five sections on this record dress themselves in the guises of modern classical, but they're really explorations of prepared guitar and avant-improv, not dissimilar to Kevin Drumm's earlier guitar-based recordings (though far more compositionally complex.) Pitre's music is obviously a product of planning and speculation, despite the majority of the performances comprising it being open-ended wandering by the players involved. The result is a beautifully organic LP that flows and floats, lazy without being complacent. "Feel Free" is based around pre-recorded guitar string harmonics in Just Intonation played by a computer in random order around which a performer or various performers can add to improvisationally. Whether they work with the harmonics or against them is the beauty of the piece; the performers can "feel free" to do as they like, creating either total discordance and cacophany or lullaby soothe. The players on this particular version of the piece mostly opt for the latter approach, working with Pitre's prepared harmonics in a way that almost defies spontaneous interpretation. Things are spacious but full of sound, busy but never grating. Stringed instruments behave in a distinctly percussive way, rebelling against preconception and giving way to unique reimaginings. The five pieces that make up "Feel Free" have a marked dreaminess, a sort of malleability that washes in and out without ever really letting go. There is an ebb and tide, a push and pull, a dark and light-but the composition never gives itself fully to any of these moods, instead choosing to reside in a mysterious and lovely middle place betwixt a rainbow of tones. Lest one accuse Pitre of aimless atonal wandering, his approach has always been one of layering and building. Taking cues from classic demonstrations of musique concrete, Pitre understands the power of sounds placed together with one another, whether in juxtaposition or cooperation. There is magic in chaos just as there is harmony in peace; the composer's ultimate job is to place those elements in an order and manner that will evoke a specific intent or emotion. In light of that, Pitre paces "Feel Free" so that it works as both a provocation and a placation. The wealth of notes, tones, and sensibilities that define the piece across its first two-thirds represent the vastness of subjectivity, an allowance few modern composers give to their works. Those that succumb will be rewarded. Towards the end of the piece, Pitre's ensemble retreats into a massive onslaught of bowing drone and string whine, a gorgeous, thick marriage of melodies and strains that twists in upon itself over and over, creating a swirling roar of buzzing bliss. It happens so naturally, flowing from the plinks and plucks of the forms before, that you barely notice what's taken place until you're drowning in a sea of uber-layered constants that gets deeper and deeper. Pitre is in full-on master mode here, transforming the staunch unapproachability of neoclassical posturing into something totally and utterly enveloping, the purity of sound for its own sake, the wonder of simply being, of presence in a particular moment-the sheer joy of the spectacle. Whether it's the philosophical grandeur of life or the ever-changing nature and idea of music itself, "Feel Free" works with it and comments on it. This is a piece that is joyously, unabashedly alive. Listening to it is nothing less than a rejuvenation. Or perhaps meditation. The actual decision lies with you.